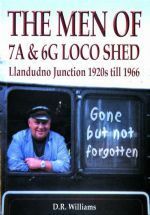 A volume containing photographs of the Llandudno Junction Loco Shed 1920s-1966. Bringing back the good old days of steam at the 7A & 6G Loco Shed, Llandudno Junction. Steam engines from all over the country would bring excursions to Llandudno in the summer. Some would stay in Llandudno to be coaled and watered and fireboxes cleaned out before going back on duty, and some engines would return back to Llandudno Junction Loco Shed to be serviced, coaled and watered, plus fireboxes and smokeboxes cleaned out before going back out on duty. The book is dedicated to all the staff who worked at Llandudno Junction and brings back many memories of that era of steam locomotives.